So far we have reviewed the evidence of a huge corpus of knowledge in the Old World in both mathematics and astronomy that only recently, after long and dark millennia, have been equaled or improved. Back to this side of the world, one can see the remains of magnificent pyramids whose builders, the old Mayas, developed so accurate a calendar that it established the year of 365.2422 days – a lot more precise than the Julian of 365.2500 and even the Gregorian of 365.2425 days, in use until now. The Mayas also developed a numbering system based on the position of values, whose use would only become general in Europe from the Fifteenth Century onwards, and which implied the conception and use of zero. gives a Long Count date of 8.5.16.9.9, or 156 CE. In this connection, it has become widely known that the Mayan calendar was based on the so-called Long Count, whose starting point was established in about 3114 BC and was supposed to end about 5,125 years later, i.e. in 2012 AD approximately. Further elaborations about this striking feature can be seen in my “About Year 2012” here. As to the Toltecs and Aztecs, great builders of pyramids, and the mysterious, much older Teotihuacans and Olmecs, I have mentioned elsewhere that they apparently were the first to develop a sophisticated astronomy and an accurate calendar; probably as accurate as those of the Tiahuanaco and the Incas, which were altogether astronomical and agricultural and so sophisticated – at least with the Incas – that they included the biological cycles of some plants and animals. I need not say that all these cultures determined with utmost precision the dates of the equinoxes and solstices. This was made for example, in the South of Peru, by the Pre-Inca compound which features the mysterious “lines of Nazca,” regarded as the world’s largest astronomical calendar, and by the Inca monolith known as Intihuatana (“the Sun-hitching stone”), a clock or astronomical device that stands out at the highest point of the citadel of Machu Picchu, near Cusco. Other witnesses of the great advances made all over the world from remote times can be seen, even today, in the ruins of ancient cities whose existence was legendary or unknown, like Mohenho-Daro and Harappa, in India, so advanced that their streets had canalizations and their houses bathrooms, and a meaningful fact: their inhabitants apparently did not wear any offensive weapons. 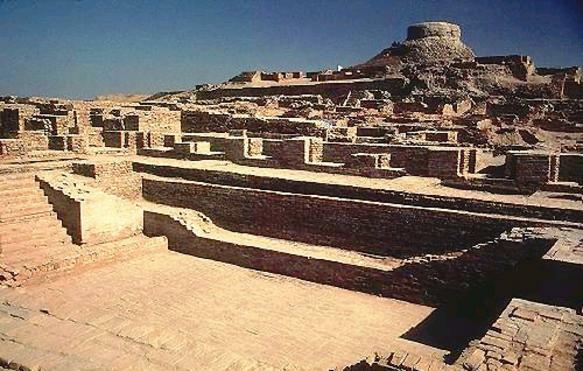 Here too, mysterious engraved inscriptions were found that even now can be seen in Mesopotamia where, by the way, from a deep Sumerian layer pertaining to 3000 BC or before was unearthed a statuette of Shiva meditating in Yogic stance, identical to another found in the ruins of the Mohenho-Daro citadel – obviously indicating that it was made before that date. These findings not only suggest that already in remote times there were relationships among great civilizations, but also – as further claimed by some people – that the Sumerian civilization originated in that city-state, which in fact would be a lot older than is officially accepted. There even are traces of a vast civilization that would have encompassed the whole North of Europe, from Ireland and Britain to the Scandinavian countries, and which would date back from as early as 9000 BC. It is very possible that the builders of the great stone observatories of Stonehenge in England and Carnac in France, as well as the gigantic zodiacal circle of Glastonbury, in England, of 30 miles in circumference, which would date back from 3000 BC, came from it. Modern analysis has shown that such builders, on top of possessing a most advanced astronomical knowledge, were great geometers who, for example, knew that a triangle whose sides are proportional to 3, 4 and 5 will always contain a right angle, a property whose discovery is attributed to Pythagoras (the author of the famous theorem) but which, in all justice, should be attributed to them; in like manner, it is known that by means of an approach that not for being simple was less advanced, they could draw huge, almost perfect circles. From these and other enigmatic vestiges, some authors have concluded that some of the posterior cultures, like the Sumerian and Egyptian in the Old World, and the Mayan and Aztec in the New, were in their respective prosperous times, and after the disappearance of some technological culture about which nothing is known at present, climbing down, and not up, the world’s civilization ladder. This notion has been reinforced by the discovery of certain documents, which include the famous map of Piri-Reis, with characteristics of 12,000 – 13,000 years ago: the Antarctic coast free of ice, rivers and mountains on the Queen Maud Land, and an ocean level lower than it is currently; the map of Zenon, which shows Greenland free of ice such as it was 14,000 years ago; that of Hadji Hamed, with the land bridge of the Ice Age between Alaska and Siberia visible; and that of Finaens, showing the Sea of Ross as it was 6,000 years ago, etc – and also by references to cataclysms which, upon extinguishing whole cities, even civilizations, would have caused a cultural reversal to various degrees of barbarianism. Such would be the case, for example, of the biblical Flood, which would have to be placed between 8000 and 10000 BC, and the destruction of Sodom and Gomorrah, which is supposed to have occurred around 3000 BC, to mention but two of the better-known examples, capable of creating conditions like the ones depicted. After that there would have come a slow, painful material progress of mankind toward present-day civilization, which does not remember a thing about a primordial civilization better than the older ones, and whose decline and imminent disappearance, in a time of profound, total global crisis as we are living now, are predicted in turn by many scholars. Do I need to add that this crisis is nowadays rampant in all orders of human existence and, in all probability, running abreast of the end time specified by the Maya Calendar and prophesized by all major religious trends and the esoteric tradition from all over the world? As was said in my last post, the universality of certain esoteric knowledge, together with the countless coincidences among different traditions in the matter of ages and cosmic cycles, can only be explained if a common origin is admitted for them all. In this sense, once this common origin is admitted for such great, enigmatic cultures like the Sumerian and the Egyptian in the Old World, and the Mayan and Aztec in the New, the question naturally arises: where could such common origin be? Many will immediately say that it could only be in Atlantis. 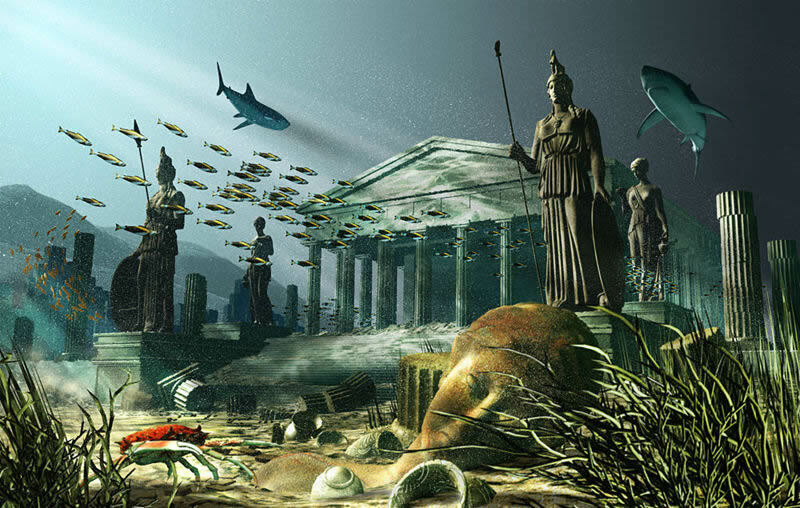 Is Atlantis sunken in the Caribbean Sea? (photo in: Who You Calling a Skeptic? However, at the risk of disappointing Atlantis’ many thousands of fans, it must be said from the start that it could not be in that emblematic island-continent. For while massive evidence has been presented for its existence, mainly in the several thousands of books that have been written about this matter over the years, a careful consideration of all the existing data, particularly the timeframe involved, will show that Atlantis was at best a secondary center that radiated, like many other worldwide culture–radiating centers at different times, at a moment when the current Manvantara was fairly advanced, i.e. when the primeval tradition, being Polar by nature and therefore centered around the Ursa Mayor, had already changed into zodiacal and was now oriented to the Pleiades – a fact that becomes specially relevant if we remember that the Pleiades were Atlas’ daughters, from which they were called “the Atlantides”. On the other hand, there is no doubt at all that the Atlantis civilization existed. Perhaps the best evidence about it are the countless geographical names on both sides of the Atlantic Ocean that obviously derive from the same source, for example Aztlan, a mythical island which the Aztecs claimed to be their original country (and curiously enough, Atl is the word for water both in the old Mexico and the Semitic countries); and there are a lot more. A map showing the supposed extent of the Atlantean Empire. Another evidence would be what has been called the great paradox of the ancient Egypt, which seems to have passed, from as early the Old Empire times, from a simple union of proto–historic clans to a most refined civilization capable of building huge pyramids – an immense achievement which favors the hypothesis that it originated in some other part of the world, which would not be other than Atlantis. However, it is precisely as a consequence of the catastrophic sinking of the island–continent that the biblical Flood would have occurred, which, by placing both events around the same epoch, would make the former an even more unlikely place as a common cultural origin for the current humanity – all the more when, according to certain traditional data, its lifespan would have not exceeded a “great year”, i.e. a half of a precessional period. So to find the supreme center we must disregard any secondary and relatively recent centers and look farther back to the very start of the present Manvantara, then ruled by the Manu Vaivasvata of the Hindu tradition, the father of the current humanity, whom the avatara Matsya, the fish, a pre-figuration of the Babylonian Oannes, is said to have saved from the great deluge that «covered the three worlds». Such epoch would be previous to the biblical Flood by at least 40,000 years and would date back to the times of the Hyperborean Thule, located on the North Pole, where – in Homer’s words – are the «Sun’s revolutions», the home of the Celtic or Hyperborean Apollo. In effect, this is a place of delight evoked by many traditions, even the Chinese, where the Pole Star, and in general the Ursa Mayor, “the crank”, play a most significant role; but mainly by all that have an Indo-European origin, and which would be the most remote precedent of the Garden of Eden of the Judeo-Christian tradition. That the Garden of Eden had the Hyperborean Thule for its most remote precedent is proven by the fact that from time immemorial to as late as the European Middle Ages, it used to be represented as a paradisaical place located on the top of an inaccessible mountain surrounded by the sea – a most ancient image that is found everywhere throughout history, and a representation of the Earth that appears even on the Mercator maps, where the ocean is depicted as a torrent which, through four mouths, precipitates into the North Pole’s Gulf to be absorbed by the Earth’s bowels; and on which the Pole itself, as the supreme center, is represented as a black rock that rises to a prodigious height. Along these same lines, the fact that there are many of these “centers” all over the world, and that they have been variously represented as a cavern, an island, a citadel, a palace, a temple, or a pyramid, only indicates that later on there was a proclivity to evoke, by means of secondary “images”, the primeval center by excellence: Mount Meru of the Hindus, depicted in Surya–siddhanta as a small mountain located in the North Pole, and a prototype that has survived mainly in the sacred mountains of Central Asia, believed by many to be the cradle of humanity, by such names as Sumer, Sumber or Sumur – all of them clearly identical to the Sanskrit Sumeru. I will mention, in passing, that if the biblical paradise is usually believed to be located in this latter area is because it became, in the course of time, a secondary tradition from the Hyperborean; and also because the references to a paradise in Genesis are essentially symbolic, and certainly subordinated to the area in which the book was compiled. On the other hand, the fact that all these representations gave rise, in different cultures, to beautiful, evocative legends only reveals the intention to keep, over the centuries, a remembrance of such supreme center alive. Such is the case, among the Celts, of mythical Avalon of the legends of King Arthur, an emblematic image of the perfect king whose knights, numbering twelve, had twelve seats – a usual representation of the twelve constellations – set aside around a table whose center, as a symbol of the supreme center, was reserved to accommodate the Holy Grail. This in turn was a symbol of the perfect knowledge or, rather, of the place where this knowledge is safely stored all through the vicissitudes of a full human cycle – as is also the case, for example, of the soma among the Hindus or the elixir of the gods among the Greeks. For the rest, it is obvious that only in one of the two Poles could exist such ideal conditions as to make it possible an “eternal spring”, the season that rules throughout the Golden Age. In effect, in Bhagavata Purana, 5, 20:30, the Sun is depicted as revolving over the horizon throughout the year – and not just during a part of it as currently – around Mount Meru, the archetypical image of the original center. This original center is located at the core of Bhu–mandala, a schematic, most ancient representation of the Earth (and probably of the solar system, the galaxy, and the entire universe) consisting of six concentric rings separated by seas which form altogether, by surrounding the center, the seven dvipas – “islands” or continents – of the Hindu tradition. All of this would appear to ultimately take us back to a time when the plane of the ecliptic, the Equator, and the horizon of the Earth all coincided approximately – probably 50,000 years ago, when the orbit of our planet was more circular and its axis was not as tilted as is today. and is surmounted by the city of Brahma, the universal creator. I am certainly aware that this hypothesis rather rises difficulties than solves them, not the least of which is the fact that around the timeframe thus established the Northern polar region was most probably covered by a thick snow layer, a condition that does not match the one that should prevail in a “paradise”; even so, according to René Guénon and others, certain traditional data indicate that the tilt of the Earth’s axis has not always existed – rather, it would be a consequence of what is known as the “fall of man”. And while it is most unlikely that such was the case at that time, such circumstance would immediately solve the problem. Yet another likely solution would be to push the Hyperborean times back to over 100,000 years ago, i.e. twice as much as the combined length of two precessional periods (2 x 51,840 years), this by virtue of the existing analogies with the day and night of Brahma, which appear to occur for cycles of all orders and would therefore be perfectly applicable to the case. Even so, science deprives us of such possibility, for it appears that the last ice age, that of Wurm (130,000 years ago) had already started by that time, which would force us to look further back on to the previous one, that of Riss – which in turn would have spanned from 230,000 to 180,000 years ago – and the prolonged inter-glacial period of time that followed, of about 50,000 years (from 180,000 to 130,000 BC): here the facts do appear to fit, for this one epoch, in which more favorable conditions would have prevailed (perhaps the tilt of the earth’s axis was null, and its oscillation minimal), approximately corresponds to that of the of the man of Neanderthal’s and, in another order of things, to the winter solstice and mainly to the North within the analogical correlation with the four seasons of the year, as well as to the Hyperborean Apollo, the white race and, among the elements, water. Of course, in this case the “fall” would not be that of Adam and Eve but that of Lucifer himself, as stated in the famous Biblical passage of Isaiah (Isaiah 14: 12–15). All this as opposed to the epoch that we may call “Adamic”, which would correspond to the Cro-Magnon’s appearance and, in the respective analogical order, to the Autumn equinox and the West, as well as the red race and the element earth – in all of which are included even linguistic considerations, as the word Adam is related to both meanings, “earth” and “red”. However, approaching such diverse issues would require a detailed study. For one thing, with this particular method we would be exceeding the timeframe of the present Manvantara, which I have established as 51,840 common years, and the sphere of modern man, whom I don’t consider to be a “relative” of the Neanderthal but rather of the Cro-Magnon. Also, we must not lose sight of the fact that some scientists place the appearance of the earliest organized tribes in about 40,000 or 50,000 years ago, and probably in Central Asia, which parallels even the afore-mentioned Biblical exegesis. Well, I must admit that it is extremely difficult to ultimately solve these issues, as is also to be satisfied that my calculation of the total length of the Manvantara is accurate. We may remember that, according to Guénon, such length would not be 51,840 years (or 12,960 x 4) but rather 64,800 years (12,960 x 5), and I absolutely cannot challenge his knowledge of these matters, nor can I pretend to be able myself to establish with absolute certainty the starting point of the Hyperborean tradition at the date I have mentioned, something that he, to my knowledge, did not even attempt, nor did he ever attempt to trace its path in detail back to any date whatsoever. As to specifically predicting future events, it is something he always avoided, let alone establishing any date for them. In other words, nothing ensures that my calculations are not wholly or partially wrong, and if I have made them – and, for that matter, if I started this work at all – is because I felt the time was ripe for it, even contravening certain precepts of the esoteric doctrines that do not absolutely support this sort of speculation. Either way, it will be an extensive recapitulation in coming posts which will establish to what extent all the data and figures considered along this series are valid, both in my determination of the length of the current Manvantara, and of its starting and closing dates. Prior to any recapitulation or conclusions on the validity of the data and the figures considered along this series, both in my determination of the length of the current Manvantara and of its starting and closing dates, I would like to present an extraordinary document that reveals the findings of a reputed institute on the antiquity of civilization, and the deterioration of it, along history. The fact that this institute is a proponent of creationism does in no way deprive the document of its scientific value. On the contrary, it is, at least in my opinion, a ray of light amid the cumulus of misconception and intolerance that creationists and evolutionist alike are prone to shed into what could otherwise be a right understanding of the history of our planet - namely, one that scientifically and judiciously admits both trends within its postulates. NOTE: I have highlighted the most relevant parts out of the fragments presented for convenience, but I strongly recommend to read the whole document all through to its end HERE. By the Rev. J. H. Titcomb, M.A., M.V.I. THE early history of civilization is so completely pre-historic, that our only pathway of research into it is through the somewhat entangled mazes of archeological remains, of language, and of mythology. The evidences supplied out of these materials are, it must be frankly owned, somewhat indirect ; as, however, they are only to be drawn from such materials, we must make the best of them. To the purely Christian student there is, no doubt, another source of authority, furnishing him with more direct and positive evidence; for it seems scarcely possible to read the Word of God in faith, without coming to the conclusion that a knowledge of musical instruments, and of all kinds of workmanship in brass and iron, was perfectly common in the world before the days of Noah. * Indeed, how could the ark have been built according to its recorded dimensions, without an extended knowledge of the arts which belong to civilization? Again, how could Cain have "tilled the earth," or Adam have "dressed the garden and kept it," without mechanical contrivances of some kind? The horticultural and agricultural operations indicated by these terms are without any specific meaning, if Adam or Cain had nothing to dig up the soil with, but their fingers or the branches of trees. This, however, is not the main line of evidence which I propose to take up in the present paper; for although the resting on that ground alone may be very satisfactory and grateful to the devout student of Scripture, yet it lacks that basis of scientific and philosophic thought, which it is now necessary to stand upon in view of free inquiry, and to reconcile which with Scripture, is, I believe, one of the first as well as wisest objects of our Institute. Let us look around upon the earth, therefore, apart from any records of divine revelation, and examine the conditions of mankind, in regard to moral and intellectual culture. On the one side we behold races both ancient and modern, possessed of refinement and civilization; on the other side, races, both ancient and modern, marked by manifest barbarism. The question is, which condition of things is entitled to priority ? Have primeval barbarous races worked up their way to civilization by successive stages of progress ? Or, have races which were primevally civilized and refined, dropped, through successive stages of degradation, into a state of barbarism? A solution of this difficult problem is one of the most interesting and important topics that can be presented to us. So much so, that anything which tends to throw light upon it becomes valuable. Our argument, in this case, is from the less to the greater. We say, if the representatives of a civilized and refined people in Europe, by thus being cut off from contact with civilization in a strange land, can thus deteriorate and degenerate; and if this degradation can take place within the history of our own times;--how much more likely were similar and far more exaggerated results to take place in earlier periods of the world's history, when civilized races were separated from their parent stocks, and left to struggle on in isolated seclusion among difficulties of climate and nature, without any incentives to self-respect, and without any external aids to the recovery of their forfeited inheritance ? Other causes have produced similar effects, such as long and devastating wars, and chronic periods of civil discord. Our argument, therefore, is once more from the less to the greater. We say--if a nation can thus be shown to have fallen in its civilization, and to have become so deteriorated and degraded that it has lost all order of government, and every mark of morality and self-respect--although, throughout this process of disintegration, it has been sufficiently near to countries in a high state of civilization for all purposes of self-improvement; how much more is it likely that tribes which, in pre-historic times were civilized, should have gradually dropped down into barbarism, when they fell into fierce and bloody conflicts among themselves, and occupied positions in which they may have had no close contact with other tribes superior to themselves. Our preliminary position, therefore, in this controversy stands thus. As far as any testimony is to be gamed from the facts which have been recorded, either by our own experience or by authentic history, races once civilized have a natural tendency to deterioration and barbarism, whenever they are separated from the rest of mankind, and are left to the debasing influence of their own evil passions; while races, once thoroughly degraded and rendered savage, have a natural tendency when left to themselves to remain so; seldom, if ever, showing symptoms of self-culture, or advancing to civilization. Hence, simply reasoning upon the condition of pre-historic times, from facts which come within the range of actual experience and history, it seems far more logical to conclude that primeval man was first civilized, and afterwards became degraded, than that he should have been originally savage, and have subsequently become self-elevated. We are quite willing to allow that this reasoning is only in the direction of what is probable. It is not positive and decisive. In a complex question of this sort, however, where all the evidences under review are necessarily imperfect, we must be content with a general balance of probabilities. Let us now see how these arguments from probability run, when we leave the course of authentic history, and get among antiquarian remains, and mythological or traditional beliefs. But let us proceed to another branch of evidence. I spoke just now of the Greek tradition of a Golden Age. It reminds me of a vast field of mythological inquiry, the details of which are in every respect most interesting, particularly that department of it which shows the manner in which monotheism underlies every system of idolatry. When Plato, therefore, called the Deity " the Architect of the World," the "Creator of nature," "The first God ;"-- when Pythagoras spoke of Him as "All in All," "Light of all powers," " The beginning of all things ";--and when Thales declared, "God is the oldest of all things, because He is Himself unmade," † we are not to regard these sayings as sudden flashes of genius, or as gradual developments of truth unknown to preceding ages. On the contrary, they cropped up among the perversions of later heathenism, just like granite peaks among the ranges of more modern rocks, testifying of an underlying basis of truth, which savoured much more of primeval civilization than barbarism. This conclusion is worth more than it seems; for although, at first sight, there does not appear to be much connection between primeval man and even the most remote ancestors of the present American races ; yet, upon the principle that, in successive migrations of mankind from an original centre that wave of population which went forth first would be pushed furthest, this people may not unlikely be among the best surviving specimens of the very earliest period of the world. That period we believe to have been an epoch of primary civilization; by which term, however--let it be understood --I do not mean an epoch of refined and perfected knowledge like our own, in which art and science are laying all nature under tribute to promote the happiness and serve the interests of mankind. This high state of knowledge has been only reached by a long course of gradual development, and is, no doubt, much in advance of anything that ever belonged to primeval man. But that is no reason why man's original condition should have been savage. On the contrary, the whole balance of probability (apart from Scripture testimony) lies on the side of its having been one of considerable culture;--of culture, at all events, sufficient as a starting-point for civilization, because capable of providing for the necessary wants of nature, and of transmitting to posterity a primary knowledge of the arts which regulate the laws of human progress. Yet, while man's possession of civilization was in this way capable of development, we hold it to have been equally liable to deterioration--of deterioration, moreover, which, when it fell beyond a certain point, left him without any power of self-recovery. In this respect I would compare the civilization of man to the physical constitution of his body. For as the human body, when exhausted beyond a certain limit of weakness can never rally without some external means of renovation, so when the civilization of a race falls beyond a certain limit of mental and moral debasement, it is left without any recuperative power; and unless aided by some foreign nation superior to itself, will continue degraded in barbarism to the end of time. We see in some of the most debased races, trifling relics of this past civilization; as in the iron-smelting in Sumatra, the manufacture of pottery in the Fiji Islands, and the boomerang in Australia. Yet, in spite of such reminiscences of better days, these barbarians are in themselves hopelessly degraded. Lots of points to ponder above, right? And the outcome seems to be pretty favorable to our position that Hesiod's deteriorationism in the matter of human history was in no way a myth but absolutely real. In the course of my lucubrations on the nature of time I have touched some issues which, while broadly treated by some authors, are nevertheless essential to the study of cosmic cycles and ages and therefore still require from us a thorough examination. An example that may seem extemporaneous at this moment is the probability that time influences cyclically the development of humanity along brief lapses of a few years or decades and also over longer periods, and either by itself or through the stars’ activity. Note that I am not talking about two different things, as between time and the stars there is so close a relationship that it can perfectly be said that they create each other. Because if on the one hand it is by means of time that the celestial bodies are created, on the other hand it is motion – mostly circular motion – of the latter that somehow creates time - and in fact, time is, in terms of physics, inconceivable in the absence of motion of some kind. In effect, is it not the Earth’s circular motion on its axis that creates the day, and is not its almost circular orbit around the Sun that creates the year? And what is true of these two basic “short” cycles is true as well of the greater ones. Again, is it not the circle drawn by the ideal projection of the Earth’s axis over the imaginary plane of the constellations that creates the period of the precession of the equinoxes, of a decisive significance to the history of mankind? This fact, which would itself be a definite proof of a circular time, and which even throws new light on fundamental sacred texts like that of the fourth “day” in the creation of the world, should make reflect both modern scientists and the western churches’ representatives, who conceive of time as linear. For modern civilization has forgotten things that all of the past cultures, based to a lesser or a greater extent on the primordial tradition, used to regard as evident in themselves. On the other hand, it is not difficult to see that just as there is nothing in the world that is not subject to the action of time, so there is also nothing on Earth that is not somehow influenced by the Sun, the Moon and even our own planet, so that it would be absurd to think of the human being as the one alone that is not influenced by them to some extent as well. And in effect, the more we study the rhythms of nature, the more we understand that man is not an isolated entity but is part of an immensely more vast mechanism where he is influenced by the slow rotation of the Earth on its axis, the elliptic curve described by the Moon around the Earth, the Sun’s electromagnetic energy, and so forth; and where he is subjected to certain natural rhythms that parallel the twenty-four hours’ cycle, including changes in body temperature, hormonal levels and the awareness state every three hours, plus a well-known cycle in Yoga: the alternation between the right and left nostrils. As to the lunar cycle, its influence on the female menstrual cycle is so widely known that I will not mention other kinds of lunar effects about which there is some controversy. Nor will I press on physical and mental biorhythms, etc., or on certain cyclic motions of various durations the existence of which is not questioned even though their dependence on the stars remains unclear. Also, it is not clear how the stars influence the well-known seven-year cycles that we all seem to be subjected to: the first at seven, coinciding with the first dentition and the transition from infancy to boyhood, the second at fourteenth as adolescence and second dentition are reached, the third at twenty-one with adulthood, and so on. However, in dealing with longer cycles, it has statistically been proven that the stars influence agriculture as well as the existence of periods of 3.5 and 6.5 years which regulate the evolution of life on the Earth and, particularly, of certain biological phenomena like the world production of furs; which is not irrelevant because the same statistics, gathered over centuries, have helped to establish the well-known incidence of the sunspots cycle, with a length of approximately 11 years, on the psychological reaction of the masses and certain social disturbances as upheavals, etc., apart from ecological instability related to draughts and floods which obviously influence dramatically the evolution of human society. As to the still longer cycles (and here we are drawing further into matter), great philosophers like Toynbee have generalized certain favorable circumstances created by the environment, either in the form of adverse changes or of climatic challenges, as triggering factors in the emergence of civilizations which force societies to behave differently by transforming themselves from static to dynamic – and vice versa, I might add. Examples of these cycles would be the planetary synods occurring every 179–180 years whose influence over the last 12,000 years is well known. It is, for instance, accepted that after 10000 BC, following the ice withdrawal, there ensued the warmest time in all of the inter–glacial period, which reached its peak between 7,000 and 5,000 years ago. Then followed an extremely cold period that climaxed about 3,000 and 2,300 years ago, and later on an “optimum secondary climatic” which culminated in the early Middle Ages, between 1000 and 1200 AD approximately. During this period, as the artic ice pack melted, new routes were opened to the Scandinavians who settled down in Iceland and Greenland and visited North America. From then on, there is what is known as the “small glacial era”, a reversal to the hard conditions that culminated in Europe along the seventeenth century and which are probably not yet over. Another example of these major cycles are the periods of maximum/minimum solar activity apparently occurring every 500 years approximately and which were studied by astronomer John Eddy from the Observatory of Boulder, Colorado (USA), based on the analysis of the amounts of carbon 14 deposited on the annual rings of certain trees (the study was published in the Smithsonian Institute’s reports in the late 1977). An interesting feature of these cycles is that at times of peak activity, relevance was placed on the so-called “solar myths” (Aton, Lugh, Mitra and Christ), while at those of minimum on the telluric ones (Isis, Lusina and Black Virgins), so that from 3000 BC three peaks would have respectively occurred: a Sumerian, a “pyramidal Egyptian”, and that of Stonehenge. After that, from 1500 BC, three minimums: Egyptian, Homeric and Greek; then a Roman maximum at about year “Zero”, and then, by order, a mediaeval minimum, a mediaeval maximum coincident with the times of the Crusades, starting from 1000 AD, and after two minimums – respectively called “Sporer Minimum” and “Maunder Minimum” – approximately from 1500 to 1750 AD, a current maximum that was expected to end in around 2000 AD. There is no doubt, however, concerning mankind evolution, that among the major cycles the most important are the three great astronomical cycles that we have studied in more detail in a previous post, and that the most important among them, and which in a way is the central element in our study, is the cycle of precession of the equinoxes or Zodiacal year of 25,920 common years. We have given it special attention by placing particularly emphasis on the fact that 168 of them (which amounts to a “Divine Year” of 4'354,560 common years) are more or less equivalent to a Hindu maha–yuga of 4'320,000 common years, as well as on the divisions and sub-divisions that the old Egyptians, according to the Hermetic tradition, would have subjected this cycle to for the purpose of correlating it with the daily cycle of twenty-four hours. On the other hand, it is interesting that these correspondences also occur with other Hindu cycles, as evidenced not only by this fact but also by the one that I will mention as follows: for the Pythagoreans, a “World’s day” was to the common day as one day is to a second; and in effect, in one day there are 24 x 60 x 60 = 86,400 seconds, which with five added zeros becomes, in common years and according to the Hindu doctrine in its most orthodox version, the duration of a Brahma’s day with its corresponding night. 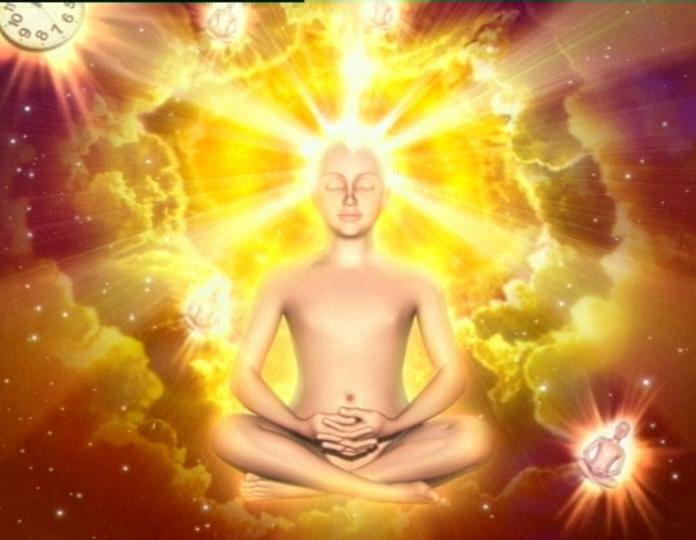 In turn, we have studied the maha–yuga and its huge multiple, the kalpa of 4,320 million years, disconnecting ourselves from all known astronomical cycles. Still, here are likely connections with present-day science, including the fact that the most remote ancestor of the human species, the recently discovered Australophitecus Ramidus, might have lived 4.4 millions of years ago – a number of years that is virtually identical to the duration of the maha–yuga. who was a descendant of the Australopithecus Ramidus. about 4.4 million years ago. On the other hand, the fact that the maha–yuga simply represents a human cycle or Manvantara, an eminently septenary period, to many qualified scholars, evidences that there are analogical correspondences between cycles of the most diverse order, and of course not only between the Manvantara and the maha–yuga, which is basically quaternary, but also between the former and the kalpa, of an essentially binary nature and divided into Day and Night – or better the opposite way, for it must be remembered that for most traditions, Night precedes Day. This in turn allows an additional inference: namely, that any cycle can be regarded as consisting of these two parts of day; and here it is possible to see yet another confirmation of the scientific – and at the same time symbolic – validity of these figures taken literally, for the Homo habilis, who no longer was an hominid but a human being almost in the full sense of the word, would have made his appearance on Earth about 2.2 millions of years ago, i.e. when the Night was just ending and the Day of the current maha–yuga was starting. As to my calculation of the real length of the current Manvantara as 51,840 common years, or two Zodiacal Years, it should be regarded as preliminary and subject to demonstration, which will be attempted later on by means of historical data. Prior to that, I would like to mention two relatively recent discoveries somehow connected to circular numbers, especially 72, which provide new approaches to the close relationship between space and time. The first of them was divulged by the magazine Geomundo (Vol. 5, No. 2, February 1981). In essence, it reveals that the ancient Teotihuacans knew, with astounding accuracy, the mean distances from the planets to the Sun. 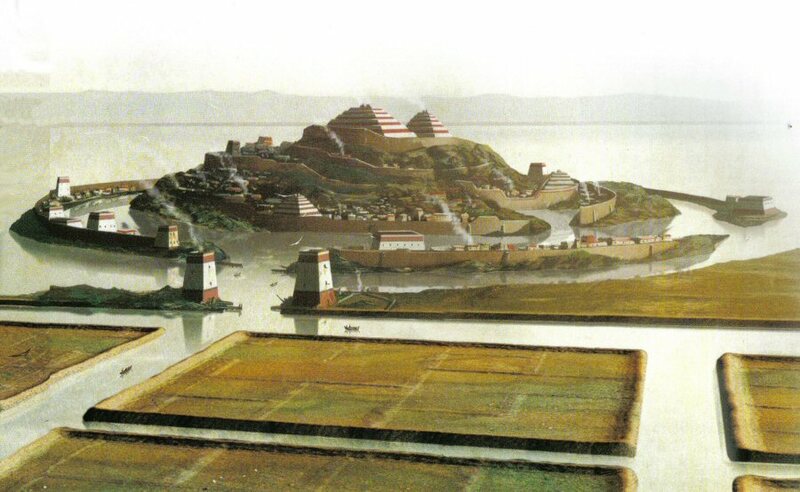 In fact, according to US engineer Hugh Harleston Jr., the author of the discovery, Teotihuacan would have been not only a great astronomical observatory but also, and mainly, a scale model of our solar system, an assertion supported by the distances measured between the stone tumuli punctuating the Avenue of the Dead from the Temple of Quetzalcoatl to the Pyramid of the Moon. In effect, between the Sun on the one hand and Mercury, Venus, Mars, Jupiter, Uranus, Neptune, and Pluto on the other, the distances measured in hunabs – the standard unit of 1.0594(6) m determined by the researcher – multiplied by a certain factor, are 36, 72, 144, 520, 1,845, 2,880 and 3,780 respectively. Compare with the distances currently established in astronomical units, equivalent to the mean distance from the Earth to the Sun and which, in the same order, are 0.387, 0.723, 1.524, 5.203, 19.247, 30.220 and 39.642, and all possibility of their being a product of chance can be ruled out. But there is the additional, significant fact that all of the distances are perfect circular numbers, i.e. numbers whose digits add up to nine, with the only exception of the distance from Jupiter, whose digits add up to seven – a “sacred” number which, while somehow anomalous, we have had the opportunity to see frequently in the course of these studies. And here we are treading again on symbolic field, for the length of the current Manvantara – as established in a previous post – is precisely the product of 72 x 720. This, however, which might be a preliminary confirmation that I was not wrong in my calculation of such length – as 51,840 years may well represent, according to all of the scientific information available, the antiquity of Homo sapiens on Earth, apart from the fact that it is in close agreement with the Brahmanic tradition that civilization appeared on our planet about 50,000 years ago – can hardly be regarded as conclusive proof of its accuracy. We need, then, more tangible evidence, such as can endure the most skeptics’ scrutiny. But since the only such evidence is the one supported by historical data, precisely what is missing in this case, we need to resort to other means in order to get it. Now, which can those means be? We will know in a next post. Before continuing with my recapitulation, I would like to present you with further information about the "lost Continent", Atlantis, as promised in a previous post. This information I posted previously on my friend Jill's Mountain of Love forum, but now I feel it also belongs here. Was the lost continent of Atlantis what we call nowadays South America? According to the below investigations, there is every reason to believe it was. As there is also reason to believe that the present-day remains of Tiahuanaco, in Bolivia, are the only direct traces left by the old mythical "island-continent." I am glad to present two independent studies by two great investigators with conclusive answers to both questions above - and the way they fit together is, indeed, fascinating. The one by a man who says Atlantis was actually the continent that one day would be re-named South America: Jim Allen, a brilliant English investigator. The evidence he presents at http://www.atlantisbolivia.org/atlantisboliviapart2.htm is most impressive. The other by someone who says Tiahuanaco is the only direct remains that is left of Atlantis: Martin Gray, not only a investigator of mysteries but a outstanding photographer as well. He has based his conclusions on the work of Arthur Posnansky, whose findings are described a few paragraphs below. To begin with, once you grant that the old Atlantis story as told by Plato in his Timeus was no mere legend, several mysteries concerning it can easily be solved if you admit Plato was describing both a large continent AND a small, volcanic island of the same name at its center. It was the small island that sank into the sea and not the entire continent. In this way, modern geology's objections that no continent can sink beneath the sea in a single day, and that no such continent has sunk into the Atlantic Ocean, are solved. In this way, too, other traditional solutions can be put aside without remorse, like the one that identifies Atlantis with sunken Santorini in the Mediterranean Sea (a ridiculously small island!) and similar ones. 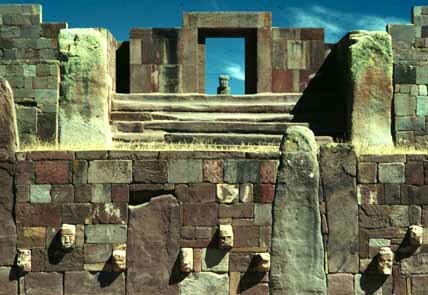 As to the above-mentioned Arthur Posnansky, he rejected the conventional archaelologists' so-called scientific truths and utilizing his measurements of the lines of sight along the stone pillars, the orientation of the Kalasasaya temple, in Tiahuanaco (see below) and the purposely-intended deviations from the cardinal points, he was able to show that the alignment of the structure was based upon an astronomical principle called the obliquity of the ecliptic. This term, the obliquity of the ecliptic, refers to the angle between the plane of the earth’s orbit and that of the celestial equator, equal to approximately 23 degrees and 27 minutes at the present. The tilt of the obliquity, however, changes very slowly over great periods of time. Its cyclic variation ranges between 22 degrees, 1 minute and 24 degrees, 5 minutes over a period of 41,000 years or 1 degree in 7000 years (this cycle is not to be confused with the better known precessional cycle of 25,920 years or 1 degree of movement every 72 years). The figure that Posnansky determined for the obliquity of the ecliptic at the time of the building of the Kalasasaya was 23 degrees, 8 minutes, and 48 seconds. Based on these calculations, Posnansky was thereby able to date the initial construction of the Kalasasaya and Tiahuanaco to 15,000 BC. This date was later confirmed by a team of four leading astronomers from various prestigious universities in Germany... (see http://www.sacredsites.com/americas/bolivia/tiahuanaco.html). Was there any factual reality behind the many Andean myths of great cataclysms and enormous floods in archaic times? Who was the legendary hero/savior Viracocha that supposedly re-seeded civilization into the Andean regions following the cataclysm? And what is the meaning behind the astonishing stories of contact, indeed settlement, from the mythic land of Atlantis? Here is one variant of the myth of Viracocha. Long ago in a forgotten time the world experienced a terrible storm with tremendous floods. The lands were plunged into a period of absolute darkness and frigid cold, and humankind was nearly eradicated.